A sunfish is originates from a North-American pond fish. In nature a Pumpkinseedfish will grow to a height of 6 inch maximum and a length of maximum 10 inch. Once this size will have been reached its weight will be circa 500 grams. The age is about 10 to 12 years old. This North American perch is a strong fish which will not easily fall ill. Your pond should be at least 28 inch deep, whereas it should have thickly and poorly planted areas. Also a shallow area of maximum 8 inch depth is important to enable the North American perch to build their nests. Pumpkinseedfish are often introduced to koi ponds in order to control vermin like insects and larvae. 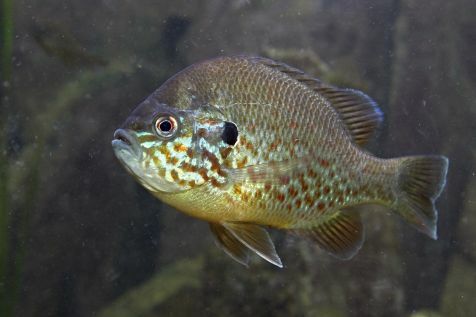 Never introduce more than one sunfish in your pond, because if they propagate and there will be too many sunfish in your pond, they will attack bigger fish. A sunfish likes balanced feed which is easy of digestion. Pond: At least 28 inch deep, locally shallow areas of 8 inch for mating. 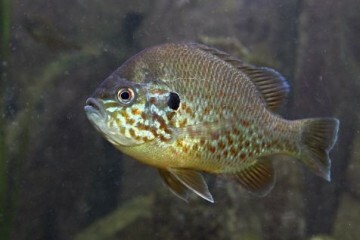 introduce at most 1 sunfish to a pond.